Or "Welcome to the Kingdom of Caledonia". Caledonia is a notional nation that has descended from the ancient nation of Pictland in the northern parts of Scotland ("Alban"). 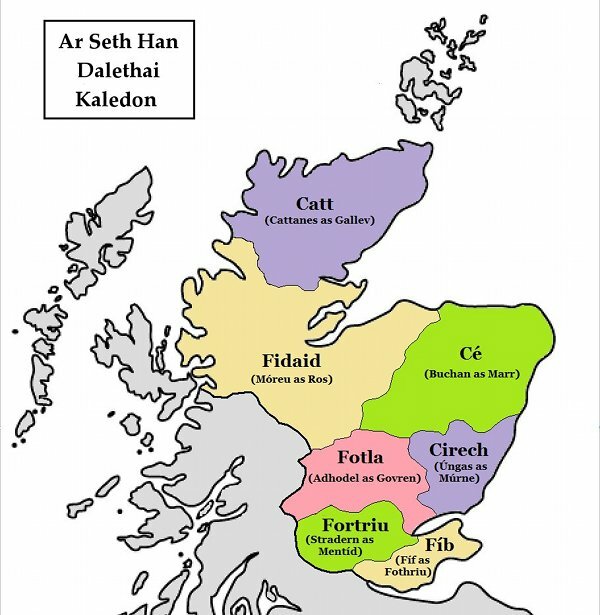 The nation exists in the 21st Century in an alternative universe to the alternative universe of Ill Bethisad, as in the real Bethisad, Caledonia is occupied by speakers of Breathanach. The inhabitants of my Caledonia speak a Brythonic language related to Welsh with Goidelic influences called Kaledonag. This language came about as the kingdom of the Picts and the kingdom of Dal Riada merged in the face of Welsh and English expansion in the south see below for more about the history). The result was a language with a largely Brythonic grammar and influences on the vocabulary by Gaelic. The Picts had been in the northern part of Britain for many centuries, but now occupied the northern part of Scotland. To the south, the vacuum left by the departure of the Romans was filled by new Brythonic kingdoms such as Strathclyde, Rheged and Gododdin. Gaels from Ireland were already coming in to settle the western areas of Scotland. Further south, the island was occupied by Brythonic kingdoms in the west and Anglo-Saxon territories in the east. Pictland by legend was split into seven provinces, that were given out to the seven sons of the nation's founder, Krithne, or Cruithne in Gaelic. These provinces are shown in the map below. Following the Roman withdrawal from Britain in 410, the Brythonic ancestors of the Welsh moved into the south-west without having to do much fighting, and set up the kingdom of Strathclyde, reaching as far north as Dumbarton (Dún Bretin). Next to arrive, ca 550, were the Scots from Ireland, who founded a kingdom north of Strathclyde (in Argyll), which they called Dal Riada from the district of Dáil Ruighe Fhada ("Long Arm's Portion") in Ulster's County Antrim, whence they came. Meanwhile, the Angles had arrived in the south-east , so that now both in the east and west foreign peoples threatened the lands to the north of the Antonine Wall, which ran from Bo'ness in the east to Old Kilpatrick in the west. At the same time, yet another people were invading from the north-west. By 800 the Hebrides and many of the Western Isles and the extreme north were in the hands of the Vikings. These common dangers hastened the process of unification bewteen the Picts and the Scots. In 843 the royal line passed to King Kenneth Mac Alpin, who was a Pict on his mother's side, and he succeeded in uniting the provincers of Dal Riada, Strathclyde adn the northern pasrt of Rheged in a new kingdom called Scotland (Ar Alban). He tried to include Pictland in this grand union, but failed to do so, leaving the Pictish realm to its corner of the island. In the meantime, the Welsh and Cornish speaking regions sharnk to their current sizes, leaving Wales (Kamri) and Cornwall (Kernu) at the extremities. These two countries, along with Brittany (Ar Vretin Veg) form the Brittonic Confederation. 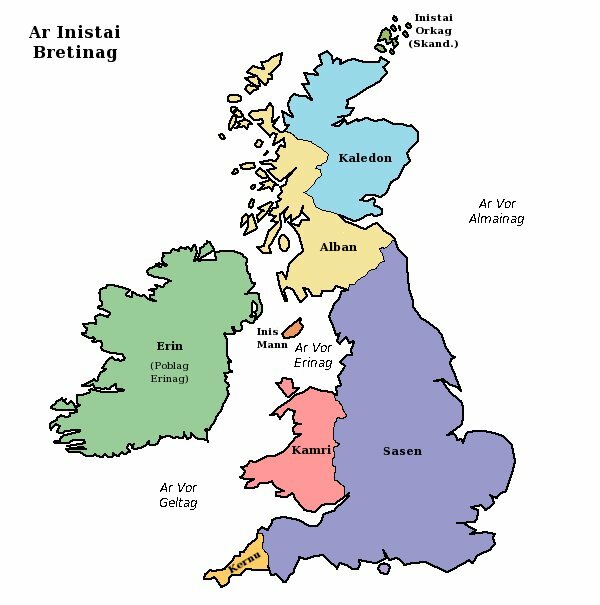 Below is the map of British Isles as it currently appears in this alternate universe.